Teething Jewelry, Chew on This! Ahh, the joys of teething. After just a few months of life, that sweet, cooing baby starts to fuss with teething pain. 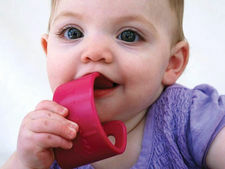 Teething babies will chew on anything within reach, including their mother’s favorite jewelry, to help relieve the pain. Most jewelry isn’t designed to stand up to this constant gnawing and can easily become damaged or pose safety risks to little ones. Knowing this, many mothers sadly put away their jewelry. Well, The Giggle Guide® thinks moms should keep their bling and provide baby with some comfort! We have found some of the most stylish and responsible lines of teething jewelry that moms can proudly wear both at home and out on the town. There are some great pieces for dads too! sonny & reed offers a fashion-forward necklace with oversized beads in beautiful blue, black and white. This signature large beaded necklace is chic enough to be worn with or without baby! Beads are soft and chewable with nubs on the underside to massage baby’s sore gums. Developed and manufactured in the US, the sonny & reed necklace is FDA approved, BPA and lead free, and meets the strictest safety standards. Started by two moms concerned with the safety of gumming traditional jewelry, the sonny & reed line focuses on two things- looking good and keeping baby safe! The Sonny & Reed line retails for $29.00. Retailers can re-order directly from the Web site. More wholesale information for sonny & reed can be found at www.sonnyandreed.com. Soothing both fussy infants and toddlers, the Oh Plah! Bracelet is made in the USA and is environmentally responsible. This oversized bangle can be used as a toy or a teether to keep little ones busy. Oh Plah! comes from the French saying, “Here you go!” The bracelet is made from a medical grade plastic that is bacteria resistant, and lead, PVC, and BPA free. The Oh Plah bangle is offered in stylish designs like; energy, harmony, serenity, simplicity, and synchronicity. As part of the Roundhouse Design Collaborative, Oh Plah is part of a “full circle” recycling program. This groundbreaking idea allows consumers to print a label from the site which pays for return shipping of used products. The old products are then recycled back into new products to be used and loved again. The Oh Plah! retails for $19.99, and the energy design retails for $24.99 with a 10% donation to Happy Child, Happy World. More information about Roundhouse Design and the Oh Plah! line can be found at www.roundhousedc.com. The Smart Mom Teething Bling collection of teething jewelry includes large pendant necklaces with coordinating bangles and even key chains. Teething Bling has a strong celebrity following with plastic pendants designed to look like real gem stones such as amethyst, onyx, turquoise, and pearl. With a focus on safety and stewardship, the Teething Bling line conforms to the highest safety standards in the USA and in Europe. All pendants offer the additional safety of breakaway clasps. Coordinating sets are available in gift sets, a unique offering of Smart Mom Jewelry! A portion of all proceeds goes to pediatric cancer research and dressforsuccess.org. Gift sets include a necklace and 2 coordinating bangles and retail for $34-$36. The donut shaped pendant necklace retails for $19.10-$21.10. Coordinating bangles retail for $12.75. 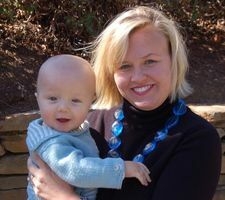 More information about the Teething Bling line can be found at www.SmartMomJewelry.com. The HeartString Baby line is “tuggable, touchable, and wearable.” This line of heart pendant necklaces is designed with parents, grandparents, and siblings in mind. With a focus on breastfeeding, this line offers necklaces with either a heart or circle pendant that can be used as a breastfeeding aid or a teething tool. By using the jewels during feedings, the necklace can transfer from Mom to Dad to Grandma and Baby will feel right at home. Each HeartString is sold with an organic breakaway lanyard to keep the jewels close at hand for baby. The Heartstring design is a free form heart with well place thumb prints to attract baby visually and to increase familiarity and bonding with both the jewels and the wearer! All products are BPA and lead free and safe for mouthing. Products retail for $22.95- $24.95. A newborn gift set, the HeartString Newborn Pendant- Duo includes 2 black and white necklaces and retails for $44.95. More information about the HeartStrings Baby line can be found at www.heartstringcompanions.com. Chewable Jewels was developed by Dentist, Dr. Helen Bloom with an emphasis on safety and optimal teething relief. 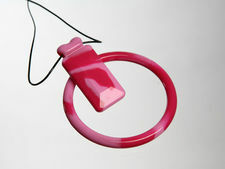 The silicone used in the pendant necklace and coordinating bangle has specifically designed thickness and hardness to help with the teething process. All materials including dyes are FDA approved and held to the highest safety standards. Pendant necklaces, loop bangles, and key chains are available in vibrant colors that look good enough to eat! Dr. Bloom’s Chewable Jewels gives back to the community donating $1 for every purple set sold to Starlight, a children’s charity, and are sending care packages to troops deployed overseas. Combo packs including both the necklace and bangle retail for $19.95. Necklaces are available with a circle or rectangle slide for $18.95. Bracelets are sold in coordinating packs of 3 for $19.95. A key chain and bracelet combo retails for $19.95. For more information about Dr. Bloom’s Chewable Jewels visit www.chewablejewels.com.